Welcoming Laxmimoni Devi Dasi Back to Toronto ~ The Toronto Hare Krishna Temple! Toronto's Hare Krishna Temple is very excited to welcome Laxmimoni Devi Dasi back home to Toronto! One of the pioneers of our Hare Krishna movement in Toronto, Laxmimoni Devi Dasi is an inspiring teacher, mentor, guide and more. Laxmimoni Dasi was initiated by Srila Prabhuada in 1969 while attending the State University of New York at Buffalo. She received a B.A. in psychology after getting an "A" for her senior sociology project: "Life in a Krishna Temple." 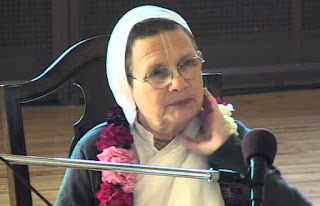 She has been involved in ISKCON educational projects since 1974. She is now a member of the GBC Ministry of Educational Development and a GBC Deputy. She was the principal of the Vaishnava Academy for Girls, in the USA, for 29 years. She has given seminars on the practice of Krishna consciousness and on media awareness and has traveled to ISKCON schools to teach primary and secondary teachers. Her travels take her throughout North America, Europe and India, where she teaches teacher-training courses and foundational seminars like the ISKCON Disciples Course and more.